I was nominated for AMIA’s Alan Stark award and received it at a ceremony presented by Reto Kromer at the AMIA conference. It was a privilege to be acknowledged with an award that focuses on work in innovation within the field. This was right after the 2016 election and still not long after the death of Gene Wilder. Here’s what I ended up saying at the ceremony. Thank you, Reto, for the kind words. I’m very thankful to my friends and collaborators and AMIA for considering me. This has already been the most emotional AMIA for me, even more so receiving the Alan Stark award and your encouragement. I’d like to speak briefly on the topic of AMIA as catalyst for and a dependant of innovation. I first came to AMIA in 2002 as a hopeful film preservationist. I attended the Selznick School and learned every aspect of film preservation comprehensively from optical to chemical and mechanical to perceptual. 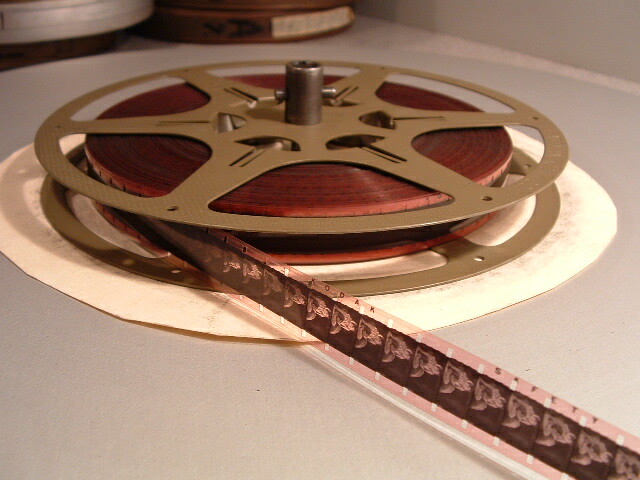 My first archival job at Democracy Now had no film, but early digital recordings. Applying a Selznick School education to a Democracy Now archive requires some serious innovation. My Selznick experience taught me the feeling of controlling a collection but I knew I was struggling for any control at work. From nitrate to MiniDV we have similar objectives but very different tools and it is very reasonable to find that innovation we require needs improvement or does not yet exist at all. Often archivists working on new technological challenges must quickly adopt the tools of related communities, but any Mac user knows the pain of trying to maintain those tools once that related community has moved on. I acknowledge that archivists have to grab onto what works to get the job done, but we can be more strongly empowered by creating, contributing, and supporting for ourselves. Just as we need to open our decks and projectors to understand, tinker and fix, just as we need to run our hands along a film print on a bench or open a cassette, we have a similar need with the new digital equivalents. Whether analog or digital, we should support our own hackers. Bringing innovation into one’s work can produce meaningful personal accomplishments; still more meaningful when such innovations can be a solution shared with others. However, the more impactful innovations may be those that also act as a building block or foothold for others to build upon or learn from. For innovation within a community, being a contributor or supporter can create a bigger impact than being a lone pioneer. AMIA has grown rapidly and I do not consider this as simply an expansion of what we already were, but as ever-changing with new voices and skills to welcome. However sometimes it feels as if we’re several simultaneous conferences. In one room we’ll lament about a digital dark age while in the next we’ll be better exploiting the opportunities of digital preservation. In one room we’ll discuss how to make diverse collections available online simply while another room demonstrates the distinct power of unique presentation forms, from cinematic to mobile. I’m grateful that this year’s AMIA, through the good work of our volunteers and instigators, seeks to innovate the form, governance, and environment of our field in order to promote opportunity, showcase more voices, and meld our ideas and visions. Recent AMIA conferences had me return to work with a focus on innovating within the archive; however this AMIA has very strongly motivated a desire to innovate from the archive outward. 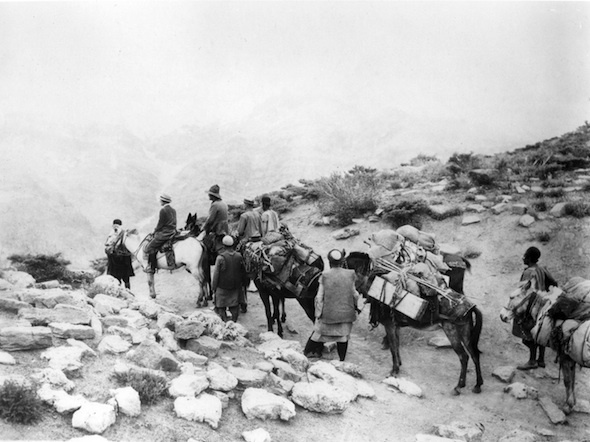 The field of archiving can contain its share of discouragement to innovation. Trying to improve our existing opportunities, can be met with resistance by those who consider that further research and innovation are not needed in an area that has already seen a pioneer or found a conceptual best practice. Or by those that consider innovation as credible only from a so-called expert. Additionally organizing our communities under uncooperative terms such as ‘analog vs digital’ limits our abilities to work stronger together. Best practices can be better, gatekeepers can be surpassed, and we together can innovate for ourselves. 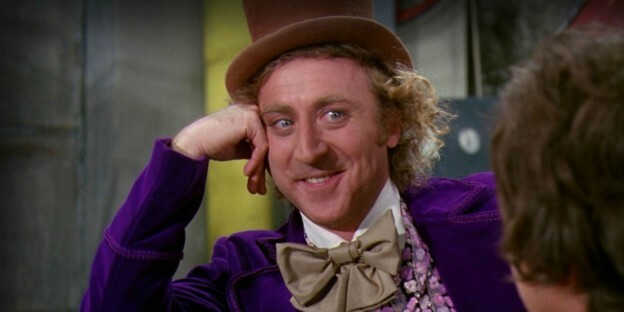 In the 35mm print of Willy Wonka and the Chocolate Factory, Wonka is demonstrating an invention of lickable fruity wallpaper. In the variable-area audio track of the print, Verona Salt ridicules Wonka to claim that no one has heard of a Snoozberry before. Willy Wonka changes his tone and quotes Arthur O’Snaughessy to assert: “We are the music makers and we are the dreamers of the dreams”. To the extent we can put ourselves into action as curators, educators, activists, and archivists, please make music and please dream dreams. Thanks again, AMIA, peace. This entry was posted in Uncategorized on January 24, 2017 by dave. I’m currently working with BAVC on a project called qctools which is developing software to analyze the results of analog audiovisual digitization efforts. One challenge is producing a software-based waveform display that accurately depicts the luminosity data of digital video. 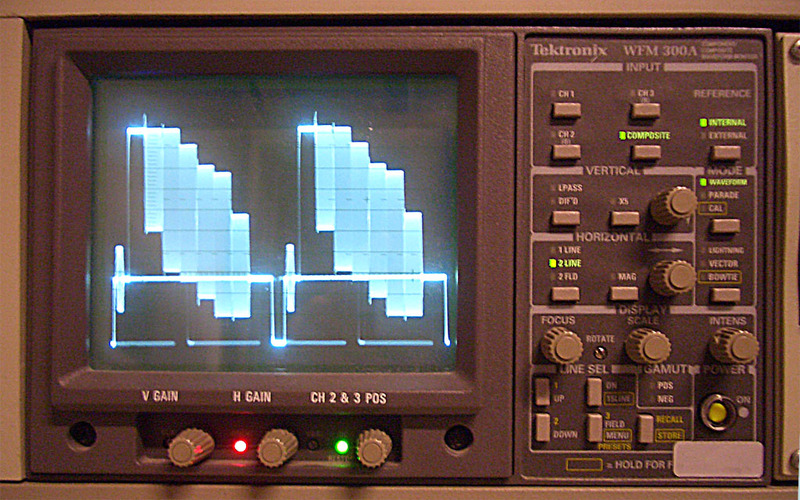 A waveform monitor is useful when digitizing video to ensure that the brightness and contrast of the video signal are set properly before digitizing the video and if not then the waveform allows a means of measuring luminosity so that adjustments could be made with a signal processors such those often available on a timebase corrector. 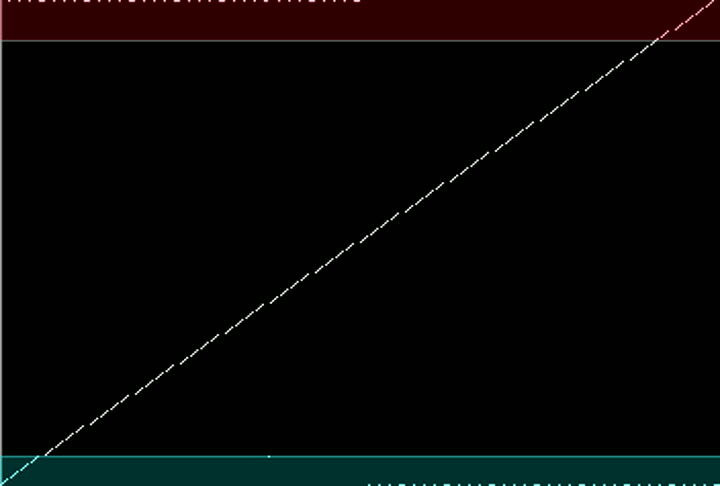 While working with a draft waveform display that I had arranged via ffmpeg’s histogram filter I realized that my initial presentation was inaccurate. 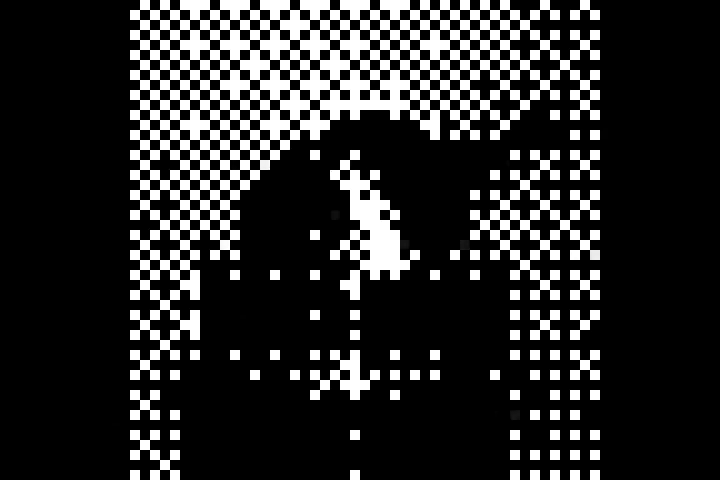 In order to start testing I needed a video that showed all possible shades of gray that an 8 bit video might have (two to the power of 8 is 256). I was then going to use this video as a control to put through various other software- and hardware-based waveform displays to make some measurements, but producing an accurate video of the 256 shades was difficult. I eventually figured out of way to write values in hexadecimal from 0x00 to 0xFF and then insert a 0x80 as every other byte and then copied that raw data into a quicktime container as raw uyvy422 video (2vuy) to make this result. This video is a 1 frame long 8 bit 4:2:2 uncompressed video that contains the absolute darkest and lightest pixels possible in an 8 bit video all possible 8 bit graytones in between separated by thick white or black stripes every 16 shades and thin white or black stripes every 4 shades. 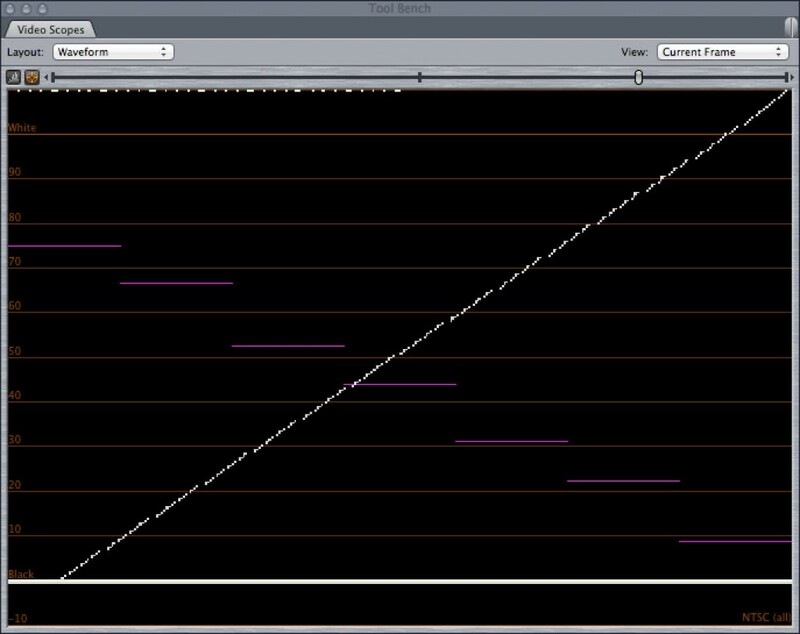 In a waveform monitor such as Final Cut’s waveform display below, the result should be a diagonal line with dotted lines at the top and bottom that show the highest and lowest shades of grey allowed. Putting the 256_shades file in Final Cut’s waveform shows that Final Cut does not plot values from 0-7.5 IRE but does plot the rest all the way up to the 110 IRE limit. However, Final Cut’s waveform display does not plot the lowest graytone values. Columns from 1-16 are not display. By divided the graytone shade number by approximately 2.33 you get the IRE value. So from 0-7.5 IRE is not plotted in this display but all crushed together at 7.5 IRE. And here is the same video displayed through ffmpeg’s histogram filter in waveform mode. A few other filtering options are added to the display to give guidelines to show values that are outside of broadcast range, from 0-7.5 IRE in blue and 100-110 IRE in red. 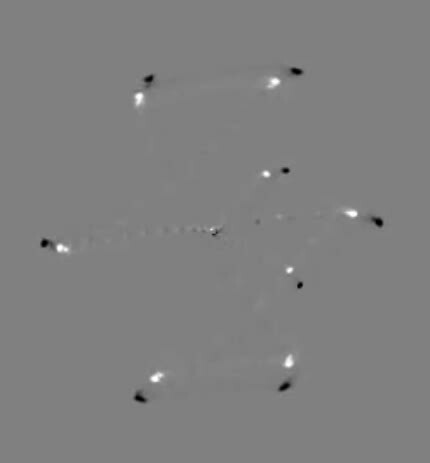 In qctools all 256 shades of gray are plotted appropriately, showing a diagonal line going from one corner of the image to another, with the white and black spacing columns show as a half-line of dots and dashes at the very first and very last night of video. Follow the qctools project at http://bavc.org/qctools for more information. This entry was posted in Uncategorized on February 1, 2014 by dave. The first time I heard about FLAC was from a co-worker within the early days of my first full-time audiovisual archivist gig. I was trying to start digitization projects and figure out preservation practices. He was working in a half-IT and half-broadcast-engineer capacity and happy to support archival work where he could help. We were discussing audio preservation and digitization of 1/4″ audio reels and he remarked on how FLAC was really an ideal choice for this type of work. I hadn’t heard much about FLAC before but based on the list-servs of ARSC and AMIA knew that when an archivist is asked to select a digital audio format that really Broadcast Wave Format (BWF) was the only legitimate choice. We went on to debate preservation objectives and the advantages and disadvantages of one format versus the other. Broadcast Wave was the “best practice” in digital audio archiving, but by the end of the conversion I was questioning why I was defending it. My colleague clarified that the choice between FLAC and BWF was not about audio quality since FLAC is a lossless audio encoding. A FLAC encoding of an audio signal and a BWF encoding of an audio signal (at the same specifications) will decode back to the same audio signal, but the FLAC file was much smaller (about a third the size of the uncompressed audio). He clarified that FLAC is an open format well supported by free software. During this conversion I was imagining the shock and disbelief that may emit from various archival communities to know that a n00b archivist was being lured towards the lossless audio codecs of Free Software. For BWF I didn’t have much of a defense; it was a well-respected standard across the audio archiving community, but at that point I didn’t know why. I feebly tried a BWF defense by pointing out that because the BWF file is larger than FLAC that it may be more resilient since a little bit corruption would have a more damaging effect on the compact FLAC as opposed to the vast BWF file. Following this conversion I searched archival listservs for references to FLAC and didn’t find much though I did find references to FLAC in archival environments at http://wiki.etree.org and band sites. This research also led me to the communities that develop FLAC and related applications. Around that time their work was especially productive as noted in their change log. All this left me confused as if FLAC and BWF play the same singular role in two parallel archival community universes. For the time, I would digitize analog audio to BWF and sleep well. There was a large amount of audio cassette transfers, CD ripping, and reel-to-reel work and we worked to keep the decks running day-after-day to achieve our preservation goals. As the data piled up digital storage became an increasing complicated issue. The rate of audio data that was being created was simply larger than the rate of digital storage expansion. As storage stresses began to grow FLAC looked more and more tempting. Finally in 2007 FLAC 1.2.1 added an option called –keep-foreign-metadata which meant that not only could I make a FLAC file from a BWF that losslessly compressed the audio but I could also keep of the non-audio data of the BWF as well (descriptive information, embedded dates, bext chunks, cart chunks, etc). Basically this update meant that one could compress a BWF to a FLAC file and then uncompress that FLAC back to the original BWF file; bit-for-bit. Knowing that I could completely undo the FLAC decision at any time with these new options, I finally went FLAC. Using the FLAC utilities and tools such as X Lossless Decoder I compressed all the BWF files to FLAC, recovering substantial amounts of digital storage. This process involved a lot of initial testing and workflow tinkering to make sure that the FLAC compression was a fully reversible process, it was, and I was happy to finally make the preservation-standard switch and invest in learning FLAC inside and out. We can wait for the most beneficial result. The –best option will prioritize file size reduction rather than encoding speed. For WAVE files or AIFF files this option will cause the resulting FLAC to store all non-audio chunks of data that may be in the source file. Ideally this option should be used during all FLAC encoding and decoding to ensure metadata survives all procedures. Optional, but I found this handy. This option applies some of the timestamps of the source file to the output, whether going from WAV->FLAC or FLAC->WAV. Verify! Digital preservation is always an environment of paranoia. This option will cause the utility to do extra work to make sure that the resulting file is valid. If everything else is successful this will delete the source file when the FLAC is completed. In addition to these option I recommend logging the stdout, stderr, and original command along with the resulting output file. When running this command the file audiohere.wav will soon disappear and be replaced by a much smaller file called audiohere.flac. To reverse the process add the –decode option: flac --decode --keep-foreign-metadata --preserve-modtime --verify --delete-input-file audiohere.flac and then you get the wav file back. The file size advantages led to benefits in other types of processing. Flac files could be uploaded to the Internet Archive in a third the time as a wav file, we could move more audio data from DATs or CDs to LTO storage. A few years later I realized another bonus of FLAC as an audio preservation file format that seems fitting within digital preservation which is the strong fixity integrations. Each FLAC file contains an md5 checksum of the encoded audio in the header. With this feature a specific audio recording could be encoded to many different FLAC files which may differ (one FLAC may be encoded for speed, another for size, another containing extra metadata) but each FLAC file would contain the same checksum which represents the source audio data. This is often called the FLAC fingerprint. etree.org has some great resources on the FLAC fingerprint at http://wiki.etree.org/?page=FlacFingerprint. The fingerprint gives all FLAC files a built in checksum and thus any FLAC file could be tested as to the integrity of its encoded data. If a FLAC file is truncated through partial download, corrupted, or manipulated in a way that would affect the audio data then the FLAC file could be identified as invalid or problematic without needing an external checksum file. Deeper within the FLAC file audio samples are grouped into audio frames which themselves are checksummed with a crc value. If a FLAC file suffers from bit rot or other corruption then a FLAC decoder such as ffmpeg’s can report on precisely where the problem is. This reporting allows an archivist a more efficient ability to resolve the problem. but this error isn’t very clear. The test shows that a crc checksum stored within the flac files failed validation so that there was some change after encoding, but the report doesn’t show where. FFmpeg does this a little better. If I decode the flac file with FFmpeg like: ffmpeg -loglevel error -i sinewav.flac -f null - then I get more specific news. FFmpeg reporting a crcerror from a corrupted FLAC file. PTS stands for presentation timestamp. The value 82,944 here refers to the sample where the problem starts. Since the sample rate of sinewav.flac is 44,100 then I can divide 82,944/44,100 to get 1.88 seconds which is where I can find the problem. 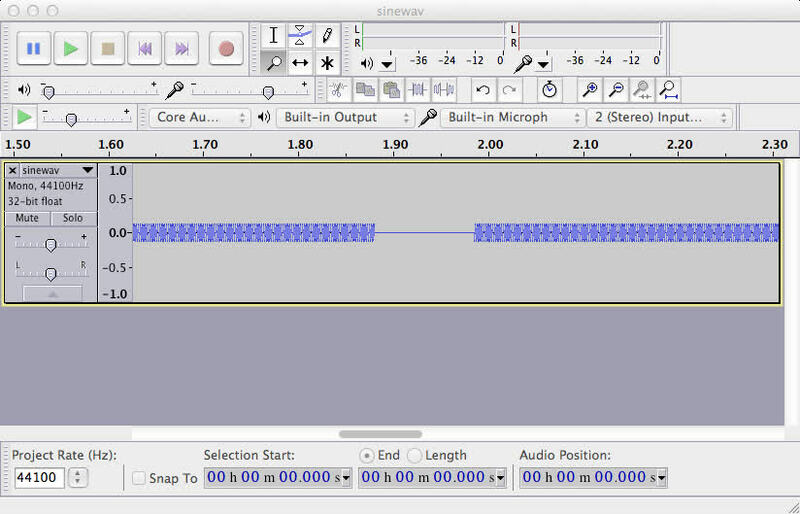 Here is the corresponding area as shown by a waveform image in Audacity. Audacity showing a corrupted flac file. Because a FLAC file contains an md5 checksum of all the encoded data and crc checksums for each frame of encoded audio it is possible to discover which fairly accurate precision what areas are affected by corruption. A wav file doesn’t have such a feature, would require an external checksum to allow for any integrity testing, and would not provide a feature to pinpoint corruption to any particular area. Moving into different archival projects I’m certainly quicker to consider FLAC a significant option in digital audio preservation. “Best practices” in archiving might not necessarily be the best use of current technology. Best practices require ongoing re-evaluation and improvements and I’d rather refer to them as “good-enough-for-now practices”. At least for me, FLAC is good enough for now. This entry was posted in Uncategorized and tagged audio, checksum, flac, lossless on November 13, 2013 by dave. Last month the IASA Journal published an article I wrote on error detection and fixity issues. While IASA agreed to publish the article under an open license, in this case CC-BY-ND, the journal does not (yet) have an open access policy. The article discusses two different approaches used in the application of checksums for audiovisual data: embedded checksums data used to audit transmission (MPEG CRCs, FLAC Fingerprints, and DV parity data) and external whole file checksums (more typical to digital preservation environments). In the article I outline how the effectiveness of a whole file checksum does not scale well for audiovisual data and make proposals on how formats such as ffmpeg’s framemd5 can enable more granular and efficient checksums for audiovisual data. The article may be found in IASA Journal Number 39 (login required) or re-posted on this blog here. This entry was posted in analysis and tagged checksum, digital preservation, fixity, iasa, open access on July 29, 2012 by dave.